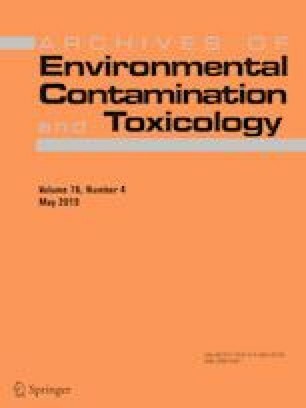 The occurrence and spatial distribution of 13 organophosphorus flame retardants (OPFRs), 11 polybrominated diphenyl ethers (PBDEs), and eight novel brominated flame retardants (NBFRs) were investigated in Jinjiang river water, sediment, crucian carp, and groundwater in Chengdu, China. OPFRs were predominant and ubiquitous contaminants in the Jinjiang river water, sediment, groundwater, fish muscle, fish gills, and viscera with concentrations ranging from 19.1 to 533 ng L−1, 12.5 to 253 ng g−1, 11.7 to 149 ng L−1, 114 to 2108 ng g−1 lipid weight (lw), 220 to 638 ng g−1 lw, and 116 to 1356 ng g−1 lw, respectively. The halogenated OPFRs were the primary pollutant in the Jinjiang river water samples, whereas nonhalogenated OPFRs were the dominant OPFRs in the sediments. Brominated flame retardants were not detected in the groundwater, whereas the NBFRs detected in aquatic environment at low frequency. The ΣPBDEs ranged from n.d. to 23.4 ng L−1 and n.d. to 48.7 ng g−1 in the Jinjiang river water and sediment, respectively. BDE-209 was dominant in the sediment samples with concentrations ranging from n.d. to 47.2 ng g−1. The PBDEs levels in the muscle, gills, and viscera of the crucian carp ranged from 10.6 to 90.6 ng g−1 lw, n.d. to 75.6 ng g−1 lw, and n.d. to 219 ng g−1 lw, respectively. BDE-47, chlorinated, and alkyl OPFRs were the main contaminants in the fish samples. The online version of this article ( https://doi.org/10.1007/s00244-019-00624-x) contains supplementary material, which is available to authorized users. This study was supported by the Natural Science Foundation of China (No. 21607108), MOE key laboratory of pollution processes and environmental criteria (Nankai University) open fund project (No. KL-PPEC-2013-7), and Tianjin fishery development service center youth science and technology innovation project (No. 18cz08).